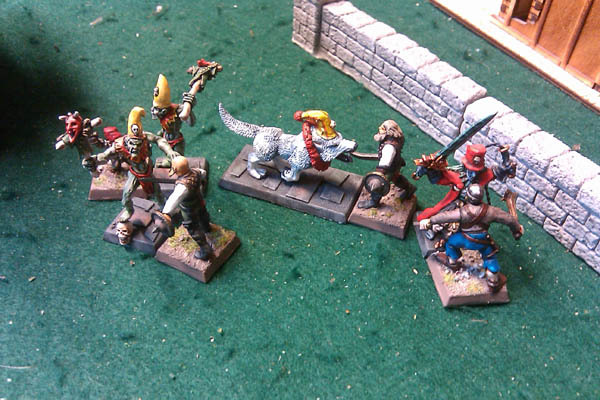 After numerous discussions, we've revived Mordheim with the local WFB group. Six of us played our first games of the campaign tonight. 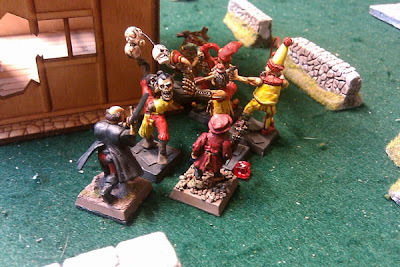 We had two Reiklanders, one Possessed, one Sistas of Sigmar... and then there was my game... sadistic Undead carnival beating up and eating up the Marienburgers for a laugh. 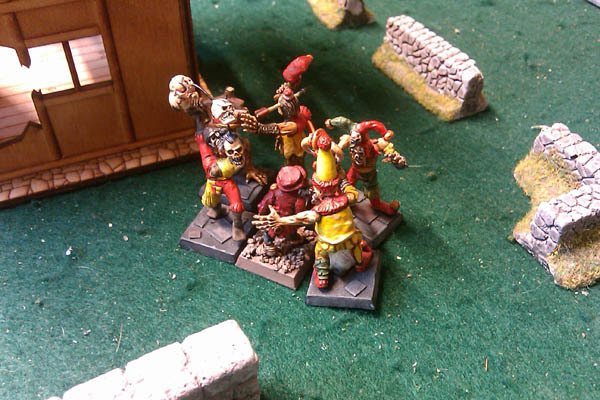 Off to the left side of my starting position, a group of zombie clowns shambles along flankwise. So I send off a detachment of melee troops to deal with it, along with covering fire from two marksmen, one with a bow one with a crossbow. After shooting provides no results (across the board -- all game) I try to send in a champion swinging a gigundous sword, and a couple warriors armed with clubs & daggers. The big charge comes... and one man runs in, the others failing their fear tests. Mr. Lucky (as he was briefly named) walks in, swings blindly at one clown and is quickly surrounded and eaten. See above. This is why people develop a seemingly odd fear of clowns. They're just not funny when they're eating your brains! 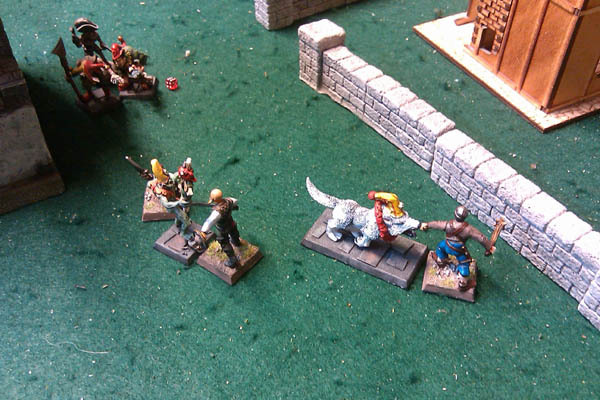 In the meantime, the major scuffle is brewing outside the ruins of a walled manor house in the center of the table. My leader (Gunter) tries to impress the vampiric Ringmaster by doing his best impression of a doormat. The rest of Team Quitter mills about, half heartedly swinging weapons to no effect. The turn following Mr. Lucky's devouration, the rest of the troops finally run into combat. However, their emotions for their fallen comrade must have been too strong to allow them to fight effectively, as the couldn't hit the broadside of a zombie. Not even the one that didn't even have a body. 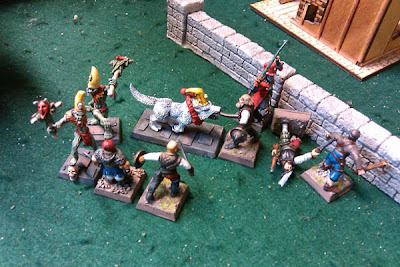 Back to the manor house, Team Leader, Gunter has been skewered, and the Ringmaster follows up into Plastic The Noob (one of my youngbloods.) The rest of the team continues flailing wildly and ineffectively at the ghouls. 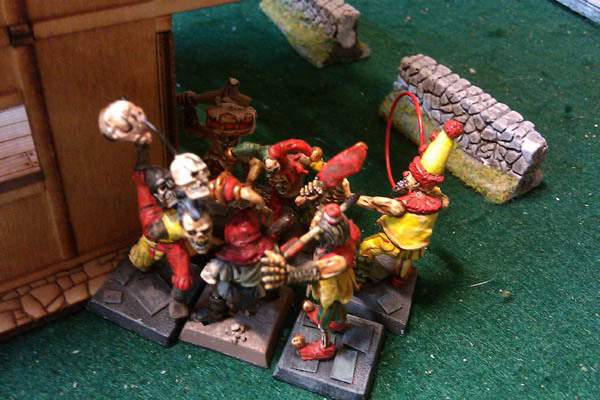 Here we see a reenactment of the legendary Mr. Lucky Zombie Clown Beatdown. It didn't go any better for his unnamed compatriot. The result? Death, death, death, injury and poverty. I lose my leader, a youngblood and a swordsman, but the champion and warrior escape and fully heal. I get almost no rewards (one shard) and don't feel the warband is worth saving. Hence, the posthumous "Team Quitter" title. The carnival, on the other hand, appear to have both made off with significant wealth, and have some satisfied and well fed zombies. Zombie clowns. I'm thinking of fielding either Skaven or Possessed next time. I feel the latter are reallly difficult to use, and tried them in three campaigns back in the day. Or maybe I should try something new. It could give me an excuse to paint some new figures. That was a good laugh! My vote is try something new. Yeah, try a new warband... Ostlanders made from the archer kit? If the group will allow it, use a Tilean band with a couple pikemen. I looked at the Ostlanders, mostly for the excuse to field an Ogre. I have not seen the Tilean rules. 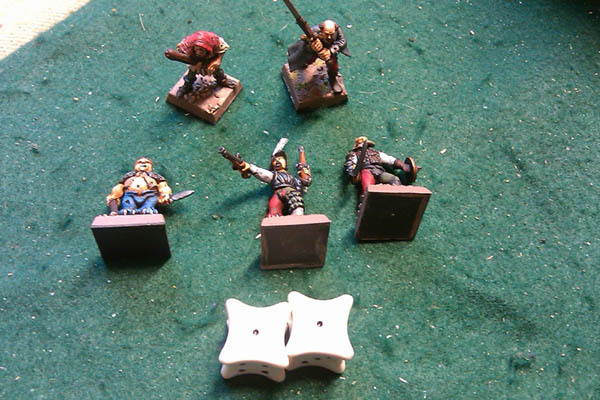 I've considered a dwarf warband with an Empire style/look. But I know they are a really powerful/annoying warband. I feel a bit dirty, because the two at the top of my list are those dwarfs and skaven, who I also think are very powerful. But I've done several human warbands, and have burned out my patience going through multiple campaigns trying to build a decent Possessed warband without much luck.